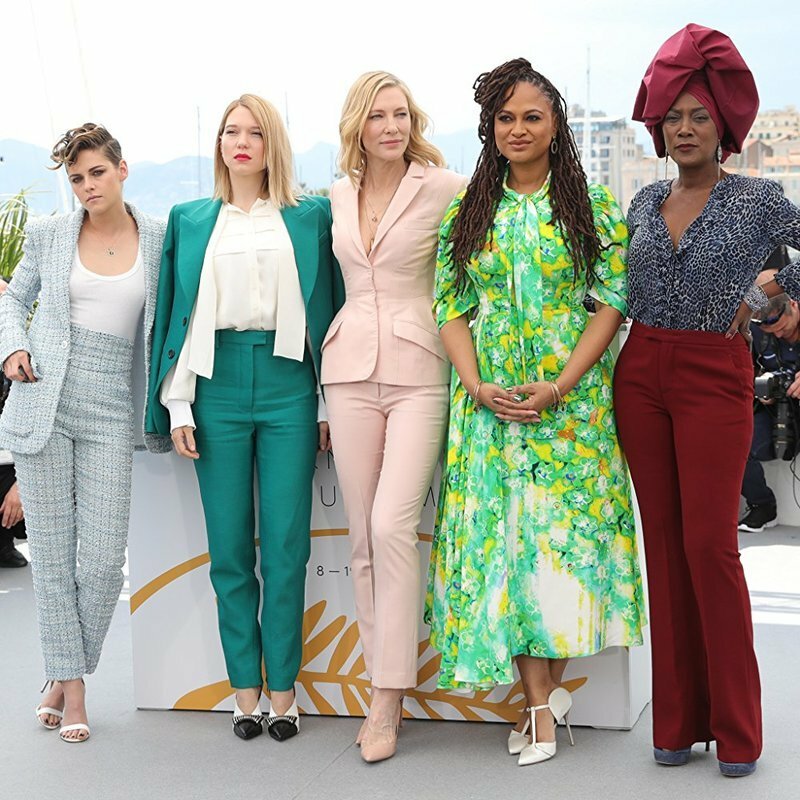 The 71st Cannes International Film Festival opened on Tuesday night, accompanied by a red carpet a bit slight on its array of international stars, but awash in the flounces, tulle and glitter of haute couture, and presided over elegantly by jury president and two-time Oscar winner Cate Blanchett. Enormous gawking crowds thronged the streets surrounding the Festival Palais, as Blanchett, wearing a sleek back-baring black-lace gown and shoulder-grazing chandelier earrings, ascended the steps with a jury that is both majority female and exceptionally diverse, including: directors Ava DuVernay (USA), Denis Villeneuve (Canada), Robert Guediguian (France) and Andrey Zvyagintsev (Russia); actors Chang Chen (China), Lea Seydoux (France), Kristen Stewart (USA); and Burundian composer, songwriter and singer Khadja Nin. Penelope Cruz and Javier Bardem, married co-stars, headlined the entrance of cast and crew of the festival’s opening film, Iranian Asghar Farhadi’s Spanish-language multi-national co-production “Everybody Knows.” Posing gamely up and down the red carpet, Cruz and Bardem were a press photographer’s delight, but proved a handlers’ challenge in terms of getting the entire party into the theater in time for the nationally televised program to begin. In the Debussy Theatre, opposite the Grand Theatre Lumiere, the international press was treated to a live simulcast of the opening ceremony hosted by suave French actor Edouard Baer along with with festival artistic director Thierry Fremaux. The overlong program preceding the film was reminiscent of the best and worst of Oscar shows in its awkward assemblage of cabaret act, copious film clips, industry tribute, and celebrity showcase. Finally, Cate Blanchett and American director Martin Scorsese combined forces to declare the festival officially open, triggering good-natured laughter as the audience took in the height disparity of at least a foot between the diminutive Scorsese and the relatively towering Blanchett. The story of “Everybody Knows” begins with the arrival of Laura (Cruz), a married mother of two returning her Spanish hometown for her younger sister’s wedding, accompanied by her small son and her teen daughter Irene. She is married to a reputedly wealthy Argentinian, who has not come along, the subject of comment among the locals. It is quickly established that Laura grew up with and shares a romantic history with vineyard owner Paco (Bardem); that Paco’s vineyard once belonged to Laura’s family; and that romantic history may be on the verge of repeating itself when reckless wild child Irene experiences a instant attraction to Paco’s nephew. Farhadi brings a farcical aspect to these opening sequences. Bardem’s Paco is puzzlingly buffoonish, given to an overacting out of synch with the rest of the cast. The wedding is marked by little mishaps, including the accidental ringing of the church bells, prompting the priest to pause the ceremony with a comical plea for donations. Portents of trouble include the sight of a drone hovering over the raucous wedding reception, which is interrupted briefly by a thunderstorm and power outage, but brought to an abrupt end by the disappearance of Irene, whose kidnapping is announced to Laura by text message. Farhadi’s forte is evoking contemporary moral dilemmas that play out in melodramatic relationships complicated by the questionable bond of trust among husbands, wives, and lovers. So it is ultimately in “Everybody Knows,” but in a story that lacks the ominous clarity of the Gordian knot that tightens irrevocably around the two married couples at the center of “A Separation.” Farhadi seems uncomfortable with his foray into farcical and comic elements. The film conveys a sense of split personality when it shifts gears into the exposition of a serious crisis, perhaps best indicated by the sudden transformation of previously exuberant Paco into the most stable and sober of characters. As a distraught mother, Laura is given to frequent bouts of sobbing, while family secrets are gradually revealed in the course of frantic plans to raise the ransom money. Paco and his lucrative vineyard become central to the plans when Laura’s husband Alejandro (Ricardo Darin) arrives from Argentina at the film’s midpoint, and turns out to be bankrupt. A revelation by Laura that may or may not be a lie is the key to the money. It is feared that Irene will be killed if the police are contacted, but a retired cop is consulted. He advises that the kidnappers are likely to be found within the family circle. Suspicion falls on Alejandro, Paco, Paco’s wife Bea, and various members of Laura’s clan, still bitter over a real estate deal, as previously concealed secrets and half-truths concerning their pasts and present dealings emerge. As in “The Salesman,” the questions and moral complications are diluted and spread far and wide. While “Everybody Knows” ties up the kidnapping rather too neatly in the end, with an unexpected side plot, its many red herrings are left hanging as story directions that might have yielded a less bland and perfunctory drama. Earlier on opening day, Madame President Cate Blanchett exuded a cool sense of command at the jury press conference, an annual tradition that affords press one of the few opportunities to eyeball the jury close up and personal, or as personal as a room filled with three-hundred or so closely packed journalists and umpteen cameras can be. It’s a good guess that juries dread this obligatory event, held before they have seen a single film. French producer/writer Didier Allouch, proved an almost invisible moderator, given that he is known for dishy red carpet coverage. The whole affair had a rehearsed air of business-like calm, given that a host of issues including #MeToo, the slight number of women directors selected for competition, and film industry sexual harassment were broached by journalists present. Any attempts to broach questions of favoritism or politics were neatly deflected. “This is not the Nobel Peace Prize, it’s the Palme d’Or,” summed up Blanchett.